James Earl “Jimmy” Carter served as the 39th President of the United States. He was a peanut farmer who served two terms as a Georgia State Senator and one term as Governor of Georgia before becoming President. In 2002, Jimmy Carter won the Nobel Peace Prize. Littleberry Carter, great-grandfather of President Jimmy Carter, was murdered at a carnival by his partner D. P. McCann over a dispute about receipts from a machine known as a Flying Jenny, a sort of small merry-go-round. His distraught wife died on the day of his burial. Sources tend to disagree on the date of Littleberry Carter's death. The confusion comes from misreading articles in The Weekly Sumter Republican. An article appeared in the December 5th edition mentioning that Littleberry's widow died just hours after his burial which occurred the previous week on November 27. The November 28th issue of that newspaper (prepared the night before on November 27) mentioned the news of Littleberry's death which they just heard about at 9pm. As a result, many sources assume that his death occurred on November 27 or 28. However it was his burial that had just occurred on November 27. Also on page 3 of the December 5th edition is a proclamation from the governor mentioning a reward for the capture of Littleberry's murderer, D. P. McCann. The proclamation gives the murder date as November 24. This would be about nine days after he was wounded on November 15 and three days before his burial. Major William Cunningham was an infamous Tory officer during the American Revolution. He earned the moniker of Bloody Bill after committing numerous atrocities against his Patriot neighbors. One such atrocity was against Andrew Seawright, the 5th great-grandfather of President Jimmy Carter. Andrew Seawright was born about 1712 in Ireland. He and his family immigrated to South Carolina arriving in Charleston in 1762. Among the family traveling with him was his son James Seawright, 4th great-grandfather of President Carter. James Seawright would meet his wife Elizabeth McCullough, 4th great-grandmother of President Carter, aboard the ship from Ireland. Andrew Seawright was too old to fight during the Revolutionary War, but it is said that he served the Patriotic cause by supplying food to the Patriots. In 1781, Andrew Seawright's home was attacked by Bloody Bill Cunningham and over 200 Tories and Indians that he commanded. They set Andrew Seawright's house afire, burning Andrew to death inside. Bloody Bill then attacked the farm of James Seawright and Elizabeth McCullough. James was away fighting with the militia leaving Elizabeth at home with the children. Elizabeth was able to escape from the Tories and hide in the fields with her children during the attack. Unfortunately the night was very cold and two of the children would freeze to death before the night was over. One child who survived the night was Jane Seawright, President Carter's 3rd great-grandmother. 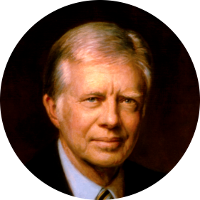 President Jimmy Carter has a number of fellow U. S. Presidents among his famous kin. This includes, but is not limited to, Zachary Taylor, William H. Harrison, Benjamin Harrison, Theodore Roosevelt, George Washington, Richard Nixon, and Barack Obama. He also has royal connections that include being a direct descendant of King Edward I, and to the current royal family through kinship to Princess Diana and Catherine Middleton. Given the story of Jimmy Carter's ancestor Andrew Seawright (above), it seems only fitting that a number of his famous kin include prominent patriots of the American cause. This includes at least ten signers of the Declaration of Independence (i.e. Thomas Jefferson, Robert Paine, William Ellery, Lewis Morris, Benjamin Harrison V, Thomas Nelson, Caesar Rodney, Roger Sherman, Button Gwinnett and William Floyd) and one signer of the U.S. Constitution (i.e. Nicholas Gilman). Other Patriots include Robert Townsend (member of the Culper Spy Ring), Patrick Henry (“Give me liberty, or give me death!”), George Mason (Father of the Bill of Rights), Caleb Brewster (member of the Culper Spy Ring), and Francis Scott Key (author of “The Star Spangled Banner”). George Brownlee was the 4th great-grandfather of President Jimmy Carter. In his Ancestors of American Presidents (2009), Gary Boyd Roberts lists John and Alley Brownlee as the parents of George Brownlee. However, Jeff Carter, in his Ancestors of Jimmy and Rosalynn Carter, lists James Brownlee and Jean Webb as the parents of George. James Brownlee is the brother of John Brownlee. More research is needed to see which of these two brothers, is the father of George Brownlee.